All of us come with a past. If there has been no past then there would be no future as well. Or the present. A lot of people shy away from talking about their past. I know a lot of people who have hidden their pasts from their lovers or spouse as well. And by past, I do not mean the love angle alone. A lot of other elements contribute to the past of a person. He or she could have been a drug dealer in the past but still thanks to the wonderful norms of society a past is only meant for the failed love stories. Even so, how many of us actually talk about it? Of course we all have had our love stories. Some were lucky to have succeeded in their first love and the others went on to have more than one love story. Its a sad thing to fail in love, but it is not the end of the world either. Once a love story ends, the characters should die. They should not be kept alive in the mind or in the memory. Not all of us is a Deepika Padukone to get along famously with an ex. Although I would speak to my exes if I run into them, I do not keep in touch with them. I don't think it is necessary at all. When someone stops being an important part of your life, there is no need for them to be a part of it all. And getting back together with an ex would be the worst mistake ever. I spent close to three years of my life moping over a relationship and with the hopes of rebuilding the relationship and the love that we once shared. But it had more to do with not being alone than about being in love. I was more in love with the concept of love rather than the person. Also the pride in me could not accept that I had made the wrong choice. So I sat and cried and inflicted pain upon myself. And then one bright sunny day reality dawned upon me and just like that I was over with it. And I was glad. Throughout the three years I was in touch with him, which made it harder to move on. But on the day I decided to let go and move on, everything was permanently erased. Keeping in touch with hm made it difficult for me to get over the breakup, I had learnt my lesson. The next time it was easier. It took me four days to get over it and I chose to stay away from him. No calls, no messages and nothing whatsoever. It helped me heal quicker and soon I was all normal and sorted. I agree that you cannot completely forget a person or the times you shared, but if you try you can. But staying in touch with them would only make it harder. And the thing that makes it more harder these days is social media. And if you have common friends then God save you. Thanks to a common friend's tag, I saw that the guy who I used to date married the girl whom he cheated on with me. When I found out that he had a girl friend already, I dumped him. But strangely the girl friend did not. That poor innocent girl might not even be aware of what happened. A part of me was tempted to let her know though, but then I realized that it was none of my business. This is exactly why you should not have anything to do with a person after the relationship ends. That is the best for everyone. Some couples go back to being friends after moving on to other people. I find that so creepy. So now you have a different partner and you still hang around with the one who you used to love before? Doesn't looking at that persons face remind you of the past you shared? Or the pain that you went through during the break up? And no, feeling all these doesn't mean that you still are in love with that person. Believe me, it absolutely does not mean that. Atleast for me, once you have been in love with someone then it is very difficult to see that person as something else. That is when my nothing theory comes to picture. I have a nothing bucket in my mind where I put people for whom I feel nothing. These need not necessarily be only past lovers, but can include them for sure. So once I put someone in this list, then they do not affect me in anyway. Good or bad. And since I choose to not stay in touch with such people, it makes it easier for me to continue with life and not be bothered with what they are doing. Love is a sacred feeling and once it is over, there should be no remnants of it. But yes, I do know people who stay friends with their ex and act like there was no relationship between them at all. Probably, they never were in love in the first place. But then, I am no one to judge. I have my own opinions and they have theirs. 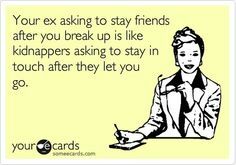 What do you think about exes being friends? I like the sound of the nothing bucket! I think I should consider having one too :) And no, staying in touch with the ex can always be a bad idea according to me. Better to leave the past as it is. Behind you. the ex tag!! what if that tag isnt there?! When I cut people off completely , I feel NOTHING for them..
recently had been dancing in my ex bf's wedding as he happened to be my friend's brother , hubby knows abt him too. That's good. I cannot even imagine doing that. A nothing bucket is a great idea. I'm not in touch with any of my exes from my past and I'm just as glad. I have enough emotional baggage as it is. Great post! Some doors are meant to be closed and to stay closed. I hadn't ever thought of a nothing bucket but it's a great concept! I agree. It sure is a great concept! Until he died, we kept in touch with my ex and even stayed with he and his wife when we had occasion to go back to England. The same with my husband's ex. We have stayed with her a couple of times also and had lots of fun with them all. I must admit my husband was calling me by his ex's name whilst we were there which did tee me off somewhat. If you have a common understanding then it is good. Oh that would tick me off too! I have been in one long-term relationship. The first time we broke up, we stayed friends but then got back together. The second time, I decided to cut ties completely in order to move on. Basically, I hadn't moved on the first time. After that, I vowed never to stay friends with an ex and kept at it. I don't know how people do it but it's their life. Doesn't work for all I suppose. Cutting off ties does the trick. I wonder how some people do it too! Love is a very complicated feeling. I guess it all depend how couples separate. I don't have an ex so I am no expert :) but with people who i have cut off, well as you said, I feel nothing for them. I feel everyone have their own perspectives at this.. there are few who are comfortable with being friends (dunno do they maintain it) and there are few who cut the ties totally.. I agree with your perspective here. It is extremely difficult and awkward to be friends with your ex. They need to be deleted from your present. I agree. If you were in love, you cannot remain friends. Fortunately I've had only one heartbreak. But that itself has been terrifying enough! I don't know what getting over means, but I feel if you loved enough, you probably never get 'over'. I somehow agree to that too. Sigh. It is impossible for me too! I am your kind. One cannot be forget friends, even in touch on a normal basis with exes. Although fortunately for me, I succeeded in my first love, if asked I would say exes cannot be friends after the relationship is over. And I strongly believe that you cannot undo the sharing part of love. So going about as usual pretending that nothing ever happened is just plain foolish. Ah lucky you! And I agree.